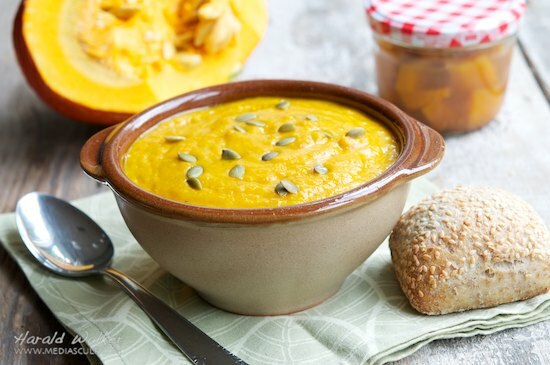 This is a delicious hearty soup with the flavors of autumn that we joyed for lunch today. garnish with croutons or pumpkin seeds. In a large soup pot, heat the oil. Add the chopped carrots and begin to sauté to soft. Add the pumpkin/squash chunks and continue to cook to soften. Stir often to avoid sticking or scorching. Add the chopped ginger, onion and shallot. Add the water, thyme, cloves and allspice and allow the vegetables to cook until soft. Puree the vegetables. It will be quite thick. Thin with the orange juice and wine. Season to taste with the brown sugar, salt and pepper. We found the soup to be delicious at this point. If you wish a thinner soup you can add more orange juice or wine. If you wish you can add soy or any non dairy cream, however we didn’t think it was needed. We garnished the soup with pumpkin seeds and enjoyed the soup with whole grain rolls. If you prefer, the pumpkin and carrots can be roasted in the oven. 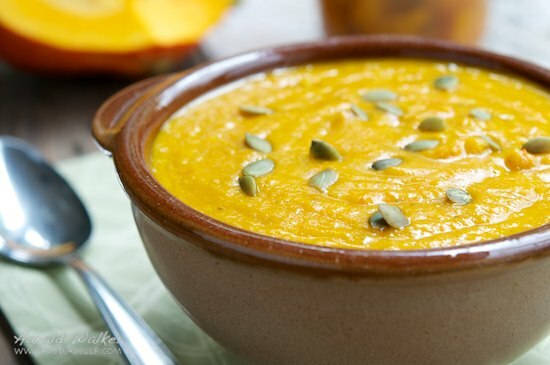 Posted by Chris Walker on September 26, 2012 in Carrot, Orange, Pumpkin, Soups, Squash.